Kuniko Yamamoto enchants audiences of every age with dramatic storytelling using myths and fables from ancient and modern Japan, spiced with social revelations to educate and amuse. Kuniko uses traditional Japanese music, handcrafted masks, stylized movement and a touch of magic to create an artistic balance of illusion and reality. Kuniko enhances Japanese Storytelling with Origami using folded paper animals and faces, which come alive in folk tales. Every program encourages audience interaction and participation. Trained in dance and traditional arts in her native Osaka, Japana, Kuniko has lived in Florida since 1992. Kuniko has performed in such venues as The Kennedy Center, Disney Epcot Japanese Pavilion; Seattle’s International Children’s Festival/Giant Magnet; International Children’s Festival in Canada; National Storytelling Festival. “TAIKO with TONI & LANCE” would like to share our passion for taiko and what it means to us. We hope that it will reach your heart and soul, and connect all who hear the thunderous rumble intermingled with the bamboo flute. 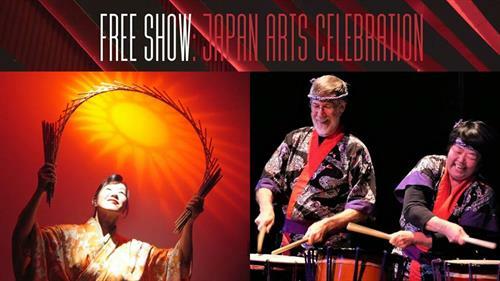 With traditional folksongs, contemporary compositions, and Japanese lullabies mixed with American traditional jazz – we bring the festival sound of Japan to you! In Japan, taiko is not just a musical instrument, but plays a vital role in the community. Taiko was used by soldiers in the battlefield for strength and encouragement; by farmers to chase insects from crops; by priests to accompany prayers for good harvests and safe villages; by communities for communication and to settle differences; and in festivals to celebrate life. Taiko has always been a part of the Japanese lifestyle. We have taught/performed taiko at schools and festivals throughout Colorado, Wyoming, Kansas, and California; taught worshops at the “North American Taiko Conference”, and performed on the east coast, England, Switzerland, and Russia. Partial funding is from the Wyoming Arts Council through the National Endowment for the Arts and the Wyoming State Legislature, the Schneider and Cate Funds in the Wyoming Community Foundation-Casper, and Natrona School District No. 1.